Rich in art, culture and glamour, Melbourne's distinct flavour is no better reflected than in the Central Business District. The archetypal Hoddle Grid layout means getting around the city centre is simple, with trams, trains and abundant laneways taking visitors to and from their Melbourne city centre accommodation. Whether you're in town to appreciate the world-renowned galleries, museums and institutions, catch one of the numerous international events and festivals that are hosted each year or just to soak up the vivid atmosphere and eclectic retail offer, the Melbourne CBD is the ideal base to see it all. In such a large and diverse metropolis, there's a style of accommodation to fit every guests budget and preference. Prices range from high-end luxury through to affordable hotels and apartments. Melbourne city centre accommodation tends to sit within the confines of the CBD boundary, so visitors will find most hotel suites and apartments lie bordered by Flinders Street, Spring Street, La Trobe Street and Spencer Street. Within this grid of tree-lined streets, guests can explore the myriad dining options (and multi-cultural cuisines) hidden down laneways and high on rooftops, enjoy the notorious bars and music venues and discover the established and upcoming designers and artists who contribute the city's creative pulse. 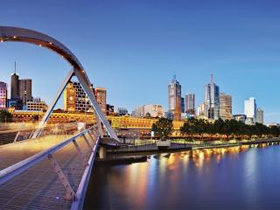 Melbourne city centre accommodation is also found along the Yarra River's Southbank and into the eclectic inner-north. Sophisticated hotels with purpose-built conference centres, five-star gymnasiums and remarkable city views line the bank and offer easy access to all the major attractions.